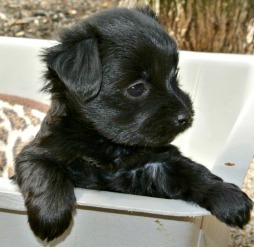 When you mix the Shih Tzu and Maltese, you get a designer dog named a Mal-Shi. 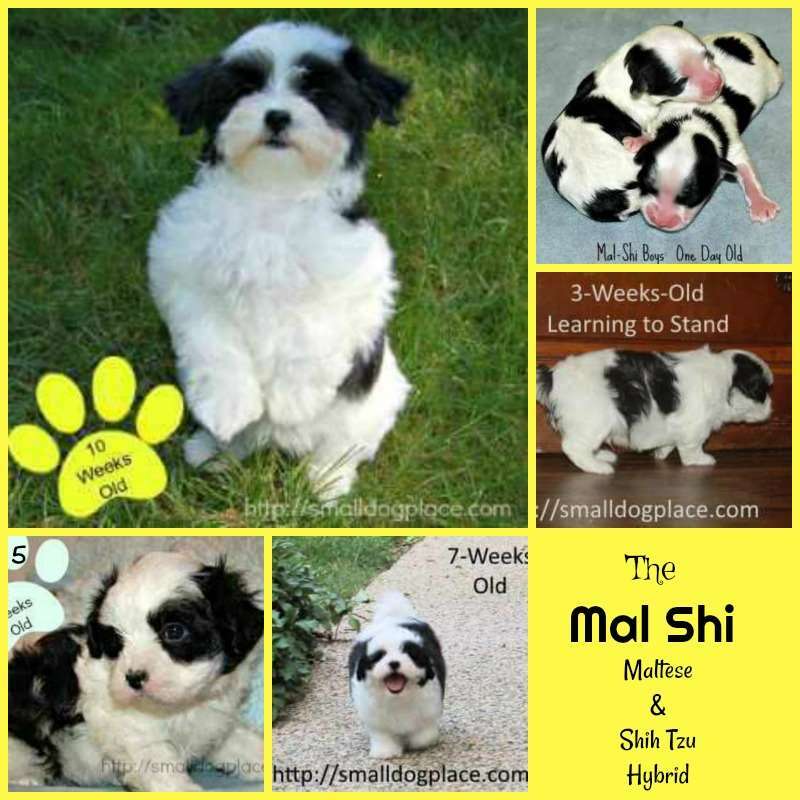 The Mal Shi also called Malte-Tzu, Shihtese, Mal-Shi, Malshi, is a mix between a Shih Tzu and a Maltese Dog and are normal considered to be a designer dog or hybrid. When a purebred Maltese Dog is mated with a purebred Shih Tzu, you are likely to get a sturdy, happy, agile, friendly companion. Not all breeders start with two purebred dogs so there are times when puppies that are called Mal Shi are actually the result of hybrid parents. For example, a Mal Shi could be one-quarter Shih Tzu and ¾ Maltese if the mother is a Mal Shi and the father is pure bred Maltese. When deciding on a puppy, it is very important that you know who the parents are. If possible when visiting the breeder, ask to see the parents. Most Mal Shi will take on the characteristics of both parents, but there is no guarantee how the gene pool will be mixed so each new litter is unique. The size of Mal Shi dogs are determined by the parents. The normal size of a Maltese is about 4 to 7 pounds and the Shih Tzu standard suggests that they should weigh between 9 and 15 pounds. There are many dogs that do not conform to the standard, so you must check the parents if you want to know how big your puppy will get. A rough estimate would be between 6 and 15 pounds. 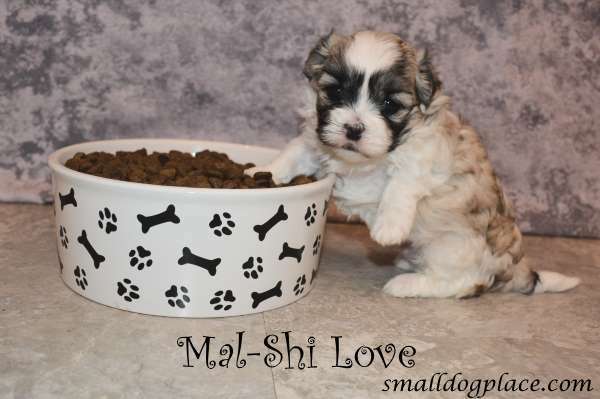 Most Mal Shi puppies will be lighter in weight than the average Shih Tzu. Sometimes the genes of one of the parents are so strong that they overpower the other making the offspring appear more like one breed rather than a mixture of both. 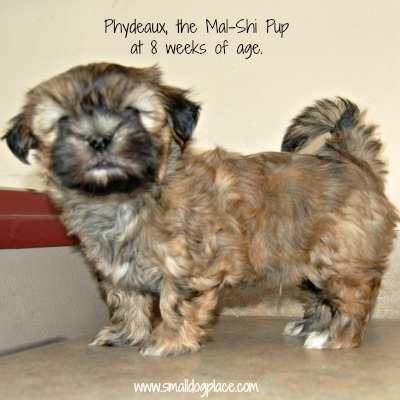 Phydeaux here resembles his Shih Tzu father more so than his Maltese mother. Both parents are purebred, AKC registered dogs, yet, at 8 weeks, it is hard to tell that he is 1/2 Maltese! Most Mal Shi dogs tend to take on color combinations of the parents, although most Mal Shi puppies will inherit most of the coloring from the Shih Tzu parent. A Maltese is always white and a Shih Tzu can come in many different colors including white, black, gold, brown (liver), red, silver, or brindle. The coat of the Shih Tzu and Maltese mix is typically long, straight, and dense. They may or may not have a double coat that is typical of the Shih Tzu. Even though most Mal-Shi puppies will resemble Shih Tzu dogs, their noses will be longer. They will carry their tail up and over their body just as both Shih Tzu and Maltese dogs do. Both breeds are non-shedding so this characteristic will be passed down to the Mal-Shi puppy. Even though you will never find puppy hairs on your furniture, these breeds to lose hair and brushing is very important to keep the coat knot-free. Most Mal-Shi puppies are affectionate, alert, loving, and devoted to their owner. These personality characteristics are typical of both breeds. Maltese are generally known to be gentle and affectionate, playful and fearless at times. They are very watchful and will alert their owners to any new sounds or movement in the environment. They are also cleaver and fast learners. 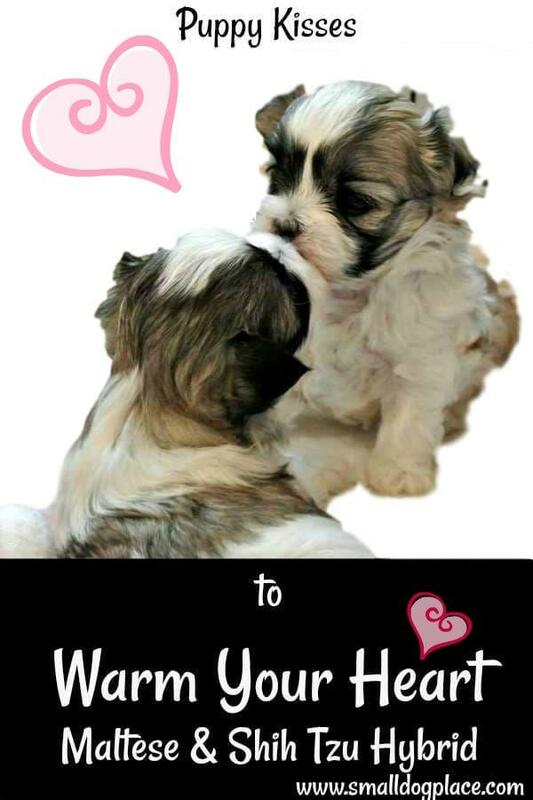 Shih Tzu are sweet and playful and have outgoing, affectionate personalities. Some are very agile and most have a little stubborn streak. Shih Tzu dogs have been bred for centuries to be a companion and house pet. When you combine the temperaments and personalities of both parents you are likely to get a playful, loving, spunky, and clever puppy. Their antics are often amusing and endearing to their owners. Due to their size, they tend to do best in a home with older, caring children. They generally do well with dogs and other types of pets. You will find that Mal-Shi dogs make excellent watch dogs as they are wary of strangers and are quick to alert their family to visitors and out of the ordinary sounds. Maltese dogs tend to bark more than Shih Tzu dogs, so the combination of both might mean you either have a barker or not. They can inherit the stubborn streak that is common in Shih Tzu dogs and may not respond well to housebreaking, a characteristic of Maltese Dogs. They do respond well to socialization and positive guidance. Training is best started early and patience and consistence is the key. The Mal-Shi requires daily brushing and combing to prevent matting and tangling. You also what to use the proper dog brush and for this breed, a pin brush works well. Bathing should be done when necessary using a mild shampoo, ideally at least every three weeks. Many owners prefer to bathe their dog weekly, especially if the dog is primarily white. The ears should be cleaned regularly to prevent infection and hair plucked from the outer ear canal. Dental hygiene is important to prevent early tooth loss. Nails need to be clipped short and hair will need to be trimmed if not kept in a long style. Their faces, especially around their eyes need to be wiped clean every day. They may be prone to such health problems as skin problems, allergies, eye and respiratory problems, and many dogs with white faces are prone to tear stains. The Mal-Shi do very well in apartment living provided they are adequately exercised and mentally stimulated. They are able to meet most of their exercise needs indoors but enjoy leashed walks, family play sessions, and off-lead play time in a securely fenced yard. If you want to register your new Shih Tzu and Maltese Puppy, visit one of the Registries for more information. Please know that Small Dog Place does not endorse any of the organizations listed below.